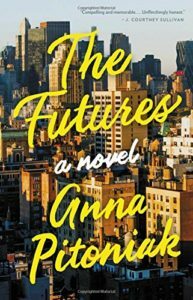 Anna Pitoniak’s The Futures is a novel about a particular slice of life in a very specific point in time: post-college New York City in the late 2000s. Julia and Evan met as freshmen at Yale and started dating after a few months of being close friends. They stayed together through his years as a Yale hockey player, her semester in France, and various college flirtations. After graduation, they move together to Manhattan, where Evan works as an analyst at a prestigious hedge fund and Julia, after a few weeks of flailing, takes an executive assistant job at a nonprofit funded by friends of her parents. As the year unfolds, their relationship is tested by a number of external forces (the market crash of ’08, Julia’s flirtation with a business journalist, Evan’s long hours) as they try to navigate their adult lives, together and on their own. Off the bat I’ll say that there are some things I didn’t like about The Futures. Julia is whiny and self-pitying, so paralyzed by indecision that she’s constantly susceptible to the motives and whims of others. She’s incapable of doing anything on her own, and the only characters she interacts with other than through work are people she knew before she came to NY. She blames everyone else for her problems and refuses to take responsibility for herself. Evan’s not much better. He does have a moral compass, but he turns out to be pretty unfeeling and unsympathetic. Meanwhile, as noted above, the book is about a very small, specific New York world: privileged Ivy League twentysomethings living in fancy NY neighborhoods. So what’s good about this book, if its two main characters are unlikable and its purview is so narrow? Well, first, Pitoniak is a very good writer. I loved her little observations and details; she knows how to describe a room or a character and make it come to life in the most vivid way. Second, I am many years removed from those untethered, often depressing first years out of college, when you don’t know what to do with yourself and you’ve lost the safety net of classmates and the college routine, but I remember them well. I, too, lived in New York during those years, and I remember that feeling of being surrounded by people who had a life and a plan, while I didn’t. Pitoniak captured that all pretty well. The story unfolded nicely, and I was eager to know what was going to happen. The alternating narrative between Evan and Julia was pretty effective, and certainly helped to underscore the growing distance between the two. The Futures is not a cautionary tale about the financial crash, but instead a smaller book about a few casualties of it. It may not be perfect, but it was entertaining and well-written, and I am glad I read it. I listened to The Futures on audio, and I can’t really recommend it. The performer who narrated Julia, Sarah Mollo-Christensen, chose to use a breathy, dramatic delivery that I found distracting (and that only enhanced Julia’s irritating qualities). The narrator for Evan, Michael Crouch, was better. Despite these complaints, though, I zipped through the audio and was eager to get back to it when I had to stop listening. Posted on November 25, 2017 by gayle. This entry was posted in Audiobooks, Fiction and tagged anna pitoniak, the futures. Bookmark the permalink. I have read some good things about this book. I am anxious to read it! I felt the same way about this one! Julia made me stabby and Evan was only more interesting because he got more of the plot. All that aside, I really liked Pitoniak’s style and am looking forward to seeing what she does next.